This is Beth. With a few more month-one tidbits. Driving—I got a ticket on the way to do the first do. Speeding captured by photo radar. Makeup— I added tinted moisturizer and eyeliner to the just-mascara look I’d been sporting since the mid-to-late ’80s. No one really noticed. 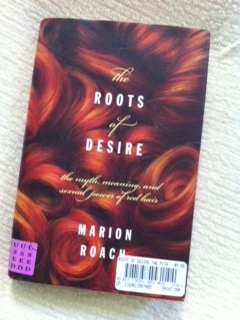 Theory—Early in the month I was presented with a book (thank you Derek and Jilly): The Roots of Desire: the Myth, Meaning, and Sexual Power of Red Hair by Marion Roach. Had planned to mine it for some good information to share before the January experiment drew to a close, but time ran out. And, sadly, I didn’t gather much in the realm of personal anecdotes.